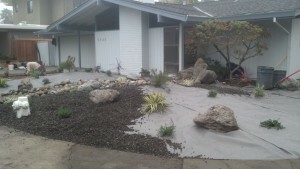 When I first met this client they had stopped watering their lawn thinking that would kill their Bermuda grass lawn that was over 20 years old. I let them know they had to water and fertilize the lawn to get as green and lush as possible so that we could spray it with herbicide to kill the most roots. Herbicide works by going into leaf from greenery and translocating to the root and killing the root. 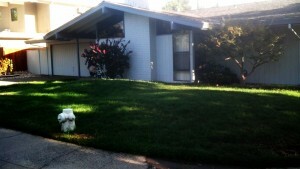 They water and fertilized lawn with an ammonia sulfate fertilizer to get it ready for spaying with Roundup. 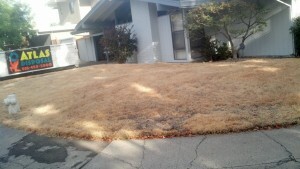 This is the lawn 3 weeks after spraying Roundup. The lawn was ready to be torn out to expose the area to sunlight and wait to see what comes back in a month or so then kill that with Roundup. 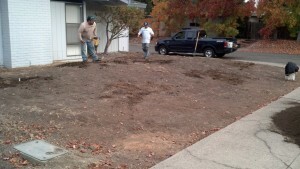 After a few months of spot spraying Bermuda grass and making sure it is dead, the long process of killing the lawn so it does not return is done and the landscape is ready to be installed. It may take a while to kill lawn but if you do not do it correctly you will regret it because Bermuda will return and grow through holes of weed fabric and grow tangled up in your plants and look horrible. Take the time to do it right the first time or you will regret it. 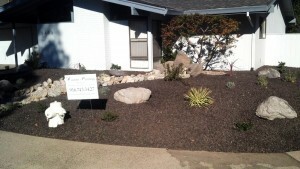 Final landscape installation was completed in three days from start to finish. 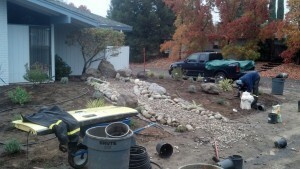 We graded soil and added many yards of soil amendment, planted plants and ran individual drip lines to each plant. High grade weed cloth laid down and rock laid on top.